Brendan played for a number of non-league clubs during his career. The talented midfielder started out with Bilston Town, Stourbridge, Redditch United and Dudley Town, before joining Worcester City in 1990. He attracted an offer of £25,000 from Gloucester City in April 1991, which included striker Steve Fergusson in the deal. 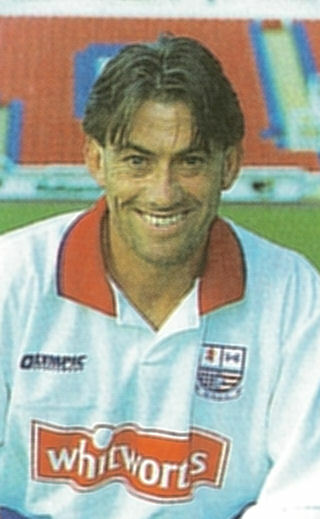 He made some 27 appearances for Gloucester before moving on to Telford United in December 1991. After a brief spell at Bilston Town, he joined Hednesford Town, helping the Pitmen to the Southern League title in 1994/1995. He played against Diamonds in their first ever defeat in September 1992, an FA Cup tie at Hednesford. After an excellent start to Diamonds 1995/1996 season, manager Roger Ashby brought Brendan to Nene Park in September and he made his debut at Cheltenham Town on 30 September 1995, in a hugely important victory that took Diamonds to the top of the Southern Premier table. He quickly became a key player in the side which gained promotion to the Conference, remaining with the club for a further two seasons. Ashby wanted to keep Brendan at Nene Park as they pushed for Football League status, but he did not want to jeopardise his career in the Steel Industry, so elected to move to Burton Albion on 8 May 1999. After a brief spell back with Gloucester City, being released as they reduced their budget, he joined Stourport Swifts in August 2000 for their first season in the Southern League Western Division, as a player/coach. After the departure of manager Rod Brown, he took over briefly as caretaker-manager, but soon joined Brown for a second spell at Redditch United in November 2001. He appears to have finished his career at Redditch at the end of the season. hi is such an inspriation, caitlin you should be so proud. He wasn’t on loan at Gloucester City the second time around, we slashed the wage bill and he was released. It was farcical at the time.